You know that feeling when you read a really good book or see a great movie and you just want to know more about the story. What happens next to the characters. Do they really have their happily ever after? This weekend Oz the Great and Wonderful opened in theaters everywhere giving us a peak at a version of the OZ stories that we had not seen before (but probably wondered about). While this movie is actually based off the book by L. Frank Baum others have taken this iconic story and put their own spin on it. This is the case for the musical "Wicked" which is based off the book Wicked which is a story that looks at the Oz story from Glinda and Elphaba's (Good Witch and Bad Witch) perspective. This is the case in the book "OZ Reimagined". It is a fun and whimsical look in short story format at the Oz story from some of the most renowned fantasy writers of our time. Gregory MacGuire, who penned Wicked, wrote the Foreword for the book. If you like FanFiction you will enjoy this book. It is a fun one to take with you on vacation because you don't have to think too hard to enjoy these short stories. You already know the characters but there is always a twist. If you scour the sale pages online you will find a number of versions of the L. Frank Baum Oz series. Be sure and read the fine print. Some have pictures while others do not. There are a number of books with a variety of illustrators. It might be worth your while to search through your local used bookstore although I rarely come across Baum books at used bookstores. They are almost as hard to find as Ian Fleming Bond titles. But as far as fanfiction goes you can find almost any fanfiction story written for almost any book, TV show, movie or game that you like. The site Fanfiction.net breaks it down by category but a quick google search will also take you to sites that are dedicated to one topic alone. There are several fanfiction sites dedicated to Harry Potter alone. If you have a favorite story and are wondering what happened next you are probably not alone. 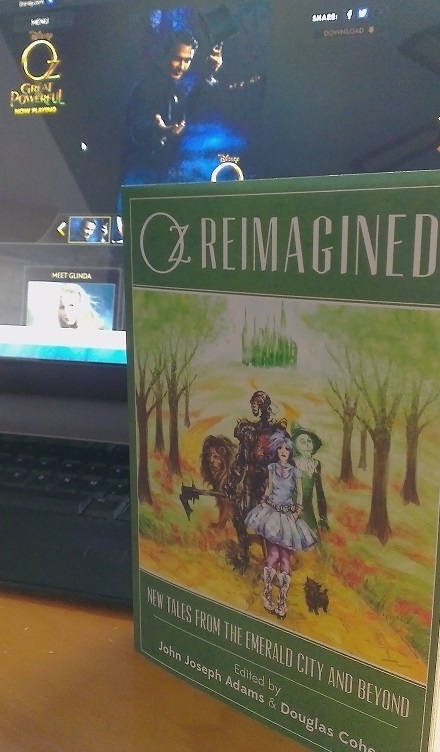 And if you want to read a fun spin on the Dorothy and OZ stories pick up a copy of OZ reimagined. All opinions and thoughts in this article are my own. I did receive a complimentary copy of OZ reimagined from the website Klout.com as a perk with no strings attached. Thanks Klout!